While there’s no recapturing the weird and wonderful feeling of playing Katamari Damacy for the first time, this week’s remaster Katamari Damacy Reroll brings all of the joy of the original tumbling right back. For those of you who’ve not had the pleasure, Katamari Damacy was a 2004 game for the PlayStation 2 that introduced a generation of gamers to the delight of quirky Japanese fare. Created by Keita Takahashi for Namco, the game tells the story of a celestial being known as the King of All Cosmos, who accidentally knocks his entire kingdom out of the sky during a drunken bender. Being as good a father as he is a ruler, he sends his minuscule son to Earth to roll up items to recreate the moon and stars. Dammit, King of All Cosmos, focus! Katamari Damacy basically translates to “clump soul” in English. The clump in this case is the ball the Prince rolls about stages, picking up larger and larger items as he goes. He rolls through a series of timed and/or themed stages, his ball growing larger with every object added. The larger the ball, the larger the items that can be picked up. The game starts off with the Prince picking up small pieces of candy and paperclips. By the end he’s rolling mountains and clouds into his mighty ball. Back in 2004, this was not the sort of game that came out in North America. Namco had no plans to bring it over initially, but showings at trade shows generated so much buzz among members of the press that the company eventually caved. Even then, the game was released in such limited numbers that it was almost impossible to find during its first few weeks of launch. Those lucky enough to secure a copy, like then part-time GameStop employees (*cough*), got to experience the weird and wonderful world Keita Takahashi created. From the ground to the clouds we rolled. Small bits of food. Fruits and vegetables. Small animals. The glee of the first time the ball grew large enough to pick up a kicking and screaming human being was overwhelming. It’s still an amazing moment in Katamari Damacy Reroll, due out this week on the Nintendo Switch and Steam. Only now it’s bigger, brighter and sharper than ever before. The items are still all variations on objects seen around Japan in 2004. While the polygons have sharper edges, the textures are delightfully blocky. The Prince and his Katamari have never looked as good as they do here, though he’s still woefully short. It plays with scale and physics in a way games still don’t often play. Rolling back to a portion of a level filled with items that were too large to be picked up your first time through is an amazing feeling. And picking up a long pencil or piece of fencing and having your Katamari go all cattywumpus is the best. The main strength of the original game was its outstanding soundtrack, which still sounds as magical as it did on day one. Its jazzy flair and gorgeous vocals still delight and entrance, 14 years later. If you’ve never played Katamari Damacy before, this is the game to play. There’ve been a number of sequels across multiple platforms since 2004, but none had the impact of the first. It showed American audiences how weird and wonderful video games could be, and Reroll is an excellent reminder. 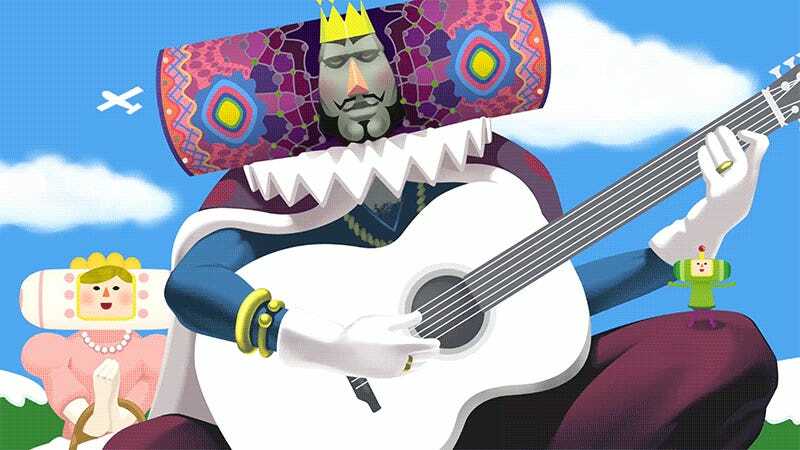 And if you have played Katamari Damacy, play it again. I received a copy of the PC version last Friday, started it that evening, and played through most of the game that evening. The hook is as powerful as ever. Creator Keita Takahashi took to Twitter earlier today with a message for fans. It still does, even with offset sticks.